No matter the industry your business operates in, it is imperative to connect online and offline marketing techniques. Many entrepreneurs have found that the better they market themselves offline, the more well-known they become online, and vice versa. For now, let's take a closer look at how you can connect your online and offline marketing campaigns to improve lead generation and increase your sales revenue. Many website development service providers provide a variety of automated analytics that are simple to use and easy to understand. When you market yourself offline through print advertising, it's a good idea to make sure to use unique tracking URLs for the links you provide in your ads and direct mail. In doing this, your web analytics can track how many people are coming to your site via the URLs on your offline marketing. You'll love being able to see how well your offline marketing efforts are paying off, and these unique tracking URLs enable you to do this. Tom is a freelance writer and the majority of his clients connect with him online. They perform a search for freelance writers, and they hire him through his website or one of the content creation platforms he is featured on. Still, there are several clients that he has secured via offline tactics, including direct mail, trade shows, and conferences. To boost prospective clients' awareness that he is going to be present at these events, he uses social media. Posting on social media can educate your prospects about the reasons they should connect with you at an offline event. Any offline marketing materials you distribute should include your unique social media profile URLs. When a person connects with you via social media profiles, this shows up in their news feed, which is viewable by their friends and followers. Tom has had numerous clients tell him they became aware of his services due to a friend following him on one of his social media profiles. When advertising your presence on social media on your printing materials, make sure to include an actual URL to each of your profiles. If you only include a social media logo, this doesn't help them find you on each platform. When marketing yourself offline, such as through direct mail, or at a tradeshow or conference, make sure you include printed coupon codes. There's a good chance the people you give them to will stuff in them their wallets or lay them on their desks once they get back to the office. Either of these places is a great place for your coupon code to be because it will give them a reminder of your brand and the services you offer. More so, it will entice them to hop online and visit your site to make a purchase using the discount code you gave them. 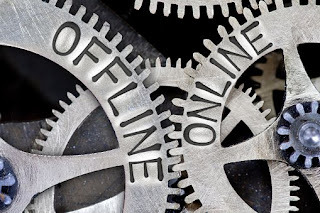 No matter the industry you are operating in, connecting your offline and online marketing efforts is crucial. As your business grows, you will quickly see how the two of these interconnect with one another. More importantly, the more you integrate the two together, the quicker you will become an industry leader.